Edwina clutches her husband Barnaby with both hands as he eyes Miss Laurel in an original publicity still for Monkey Business (1952). An unnamed lab assistant stands behind. Cary Grant takes Marilyn Monroe out for a spin in his new convertible while under the influence of B4 in an original publicity still for Monkey Business (1952). Cary Grant goes roller skating with Marilyn Monroe while under the influence of B4, the drug he created, in an original publicity still for Monkey Business (1952). 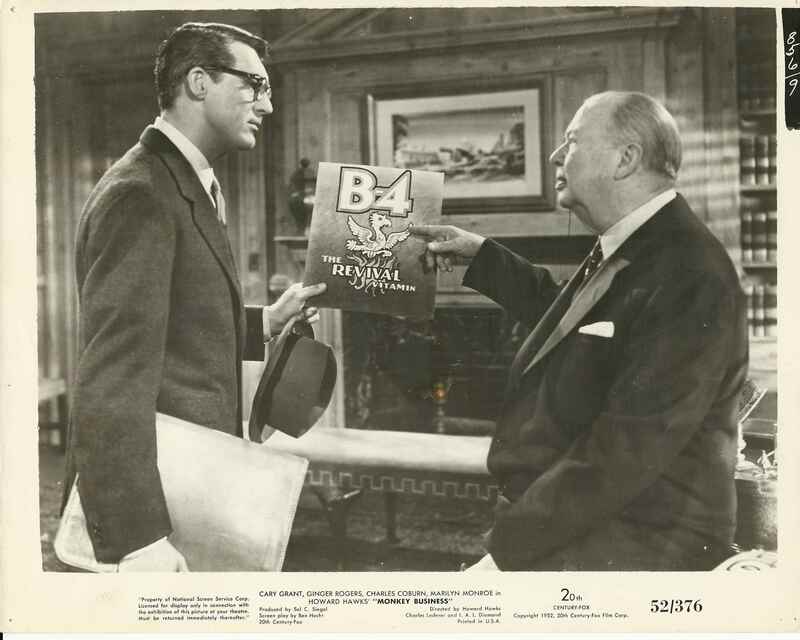 Scientist Cary Grant presents a written report on the creation of his youth drug in an original publicity still for Monkey Business (1952). Jack Hawkins behind the scenes of Land of the Pharaohs (1955) in Egypt. Howard Hawks directing Land of the Pharaohs (1955) in Egypt.